Home Known Issues PowerShell SharePoint Access is denied. (Exception from HRESULT: 0x80070005 (E_ACCESSDENIED)) on Get-SPWeb, New-SPUser, Get-SPUser, Set-SPUser, etc. Access is denied. (Exception from HRESULT: 0x80070005 (E_ACCESSDENIED)) on Get-SPWeb, New-SPUser, Get-SPUser, Set-SPUser, etc. Problem: Getting "Access is denied. (Exception from HRESULT: 0x80070005 (E_ACCESSDENIED))" on running PowerShell cmdlets, such as: Get-SPWeb, New-SPUser, Get-SPUser, Set-SPUser, etc. Add a web application user policy with Full control for the Farm Administrator who runs the Script! Click Application Management >> Select Manage Web Applications. Select your target web application >> Click the User Policy button from the ribbon. From the Policy for Web Application dialog box, click on "Add Users" link. 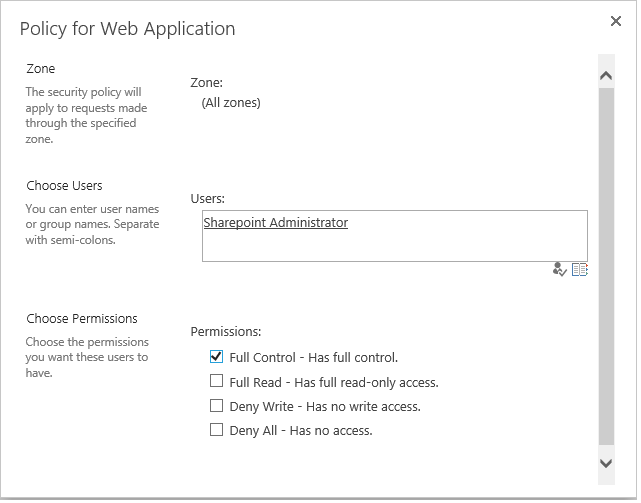 Enter the user account and Select the permission policy level as "Full Control"
SharePoint 2016 RTM is Released!